ROCKINGHAM – The so-called experts say that sports success is contingent upon not beating oneself. Drag racer Allen Furr would beg to differ. On a weekend when James Caulder and son Connor celebrated victories in Top Eliminator and Jr. Dragster, respectively, Furr stole the show by twice beating himself, once in the semifinals and once in the final round to dominate the Footbrake portion of the annual Racers Appreciation bracket championships at Rockingham Dragway. Furr, the reigning Rockingham track champion, gave himself a leg up on a second straight title by driving his venerable 1962 Chevy II to a runner-up finish on Saturday and a win on Sunday when he advanced to the final from both sides of the bracket. That meant he raced himself in the final and despite what the pundits say, beating himself was as sweet as it gets in bracket racing. Nevertheless, Sanford’s Ricky Bullock denied Furr a perfect weekend by beating him in the Saturday final. James Caulder topped Chris Dean of Sanford to claim the $2,000 cash purse as winner of Sunday’s Top Eliminator title after Connor Caulder had won Jr. Dragster on Saturday, giving the St. Pauls’ bracket contingent two big reasons to celebrate. The other $2,000 Top Eliminator prize was snatched up by Rowland’s David Lowe, who stopped Jerry Martin of Aynor, S.C., in the money round on Saturday while Dylan White or Cordesville, S.C., claimed the Sunday Jr. Dragster title. The two-day event, which had been rained out on its original weekend, also awarded points applying toward Rockingham’s 2019 track championships and berths on the Rockingham team that will compete in the NHRA’s Summit Super Series this fall. Round 5 – James Caulder, St. Pauls, .083, 6.088 on a 6.070, 113.13 mph, def. Smokey Dial, Pembroke, foul; Bobby Hardee, Mullins, S.C., 1969 Chevy Nova, .002, 6.299 on a 6.290, 106.65 mph, def. Donald Norris, Conway, S.C., .014, 5.725 on a 5.720, 118.96 mph; Tim King, Winnabow, 1988 Chevy S10 truck, .010, 6.202 on a 6.200, 110.41 mph, def. Nick Rabon, Florence, S.C., .006, 4.836 on a 4.830, 137.43 mph; Barry Nall, Eagle Springs, 1969 Plymouth Roadrunner, bye; Chris Dean, Sanford, .035, 5.910 on a 5.910, 116.75 mph, def. Bobby Hardee, Mullins, S.C., 1969 Chevy Nova,.023, 6.289 breakout on a 6.290, 107.94 mph. Round 6 – Caulder, .003, 6.075 on a 6.090, 112.91 mph, def. King, foul; Dean, .021, 5.937 on a 5.910, 114.49 mph, def. Nall, .004, 6.623 breakout on a 6.750, 96.90 mph; B. Hardee, bye. Semifinals – Dean, .003, 5.940 on a 5.920, 114.02 mph, def. B. Hardee, .020, 6.297 on a 6.290, 107.69 mph; Caulder, bye. FINAL – James Caulder, St. Pauls, .010, 6.080 on a 6.060, 114.86 mph, def. Chris Dean, Sanford, .003, 5.951 on a 5.920, 113.71 mph. 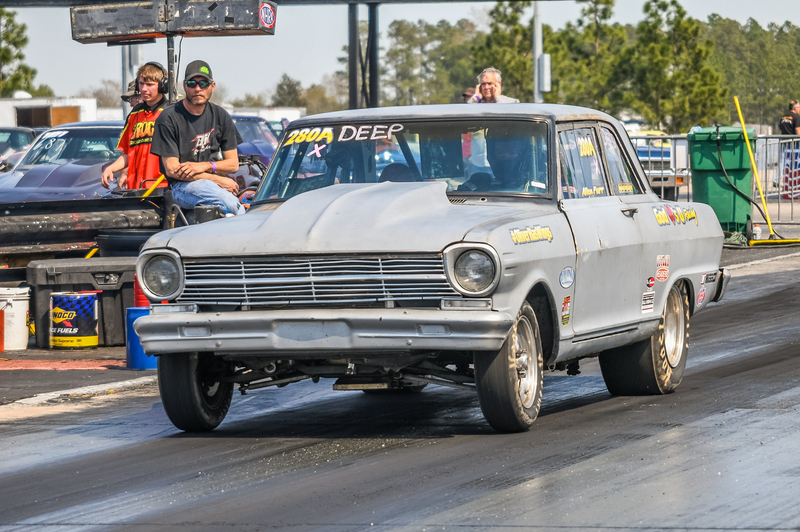 Round 5 – Allen Furr, Richfield, 1962 Chevy II, .057, 6.602 on a 6.580, 102.18 mph, def. Steve Sides, Fayetteville, 1979 Chevy Camaro, .057, 6.900 on a 6.870, 97.61 mph; Bill Clardy, Loris, S.C., 1974 Chevy LUV truck, .035, 6.357 on a 6.350, 106.19 mph, def. 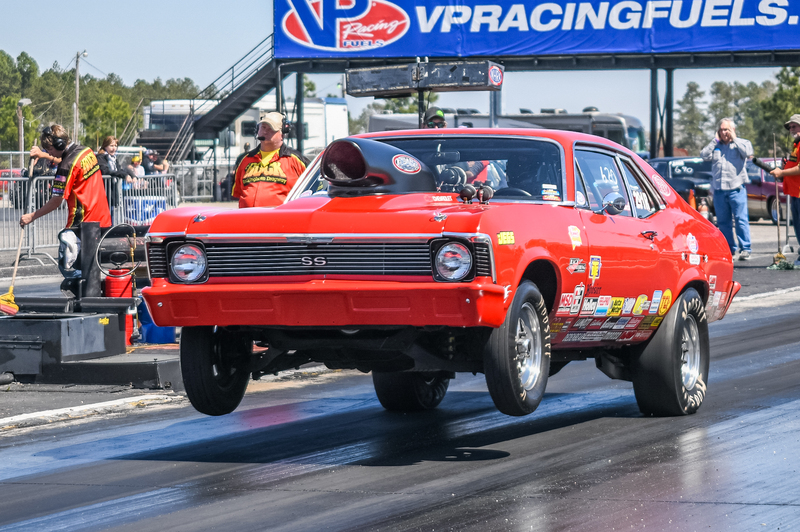 Tim Davis, Fayetteville, .037, 7.857 on a 7.830, 85.79 mph; Pressley Rollins, Pageland, S.C., 1971 Dodge Challenger, .006, 6.197 on a 6.180, 104.63 mph, def. Anthony Barker, Stedman, 1967 Plymouth Barracuda, .079, 7.203 breakout on a 7.220, 93.58 mph; Danny Faile, Pageland, S.C., 1989 Ford Mustang, .001, 6.141 on a 6.150, 111.99 mph, def. Willy Buie, St. Pauls, 1972 Chevy Nova, .030, 6.695 breakout on a 6.710, 101.56 mph; Allen Furr #2, 1962 Chevy II, .006, 6.557 on a 6.580, 104.13 mph, def. Donald Barnes, Evergreen, 1972 Chevy Nova, .015, 7.661 breakout on a 7.690, 85.28 mph; Bobby York, Pleasant Garden, 1967 Plymouth Barracuda, bye. Round 6 – Furr, .058, 6.621 on a 6.580, 102.61 mph, def. Clardy, .114, 6.351 on a 6.340, 108.87 mph; York, .011, 6.162 on a 6.140, 108.43 mph, def. Faile, .021, 6.172 on a 6.120, 110.21 mph; Furr #2, .026, 6.645 on a 6.580, 99.14 mph, def. Rollins, .054, 6.234 on a 6.180, 104.10 mph. Semifinals – Furr, .030, 6.589 on a 6.580, 105.27 mph, def. York, foul; Furr #2, bye. FINAL – Allen Furr, Richfield, 1962 Chevy II, def. Allen Furr, Richfield, 1962 Chevy II. Round 3 – Kyle Chapman, Darlington, S.C., .152, 8.935 on an 8.900, 72.00 mph, def. Brody Callahan, Fayetteville, .219, 12.063 on a 12.020, 54.21 mph; Tanner Brayboy, Maxton, .085, 11.941 on an 11.880, 52.40 mph, def. 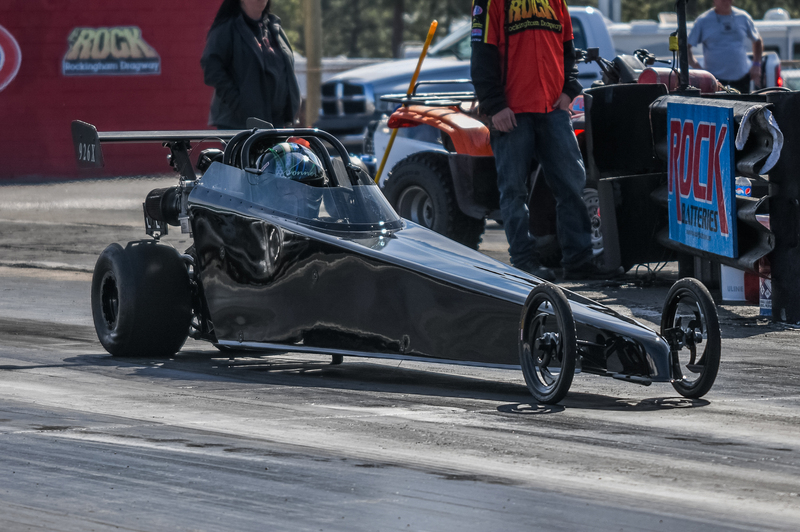 Alyssa Rabon, Florence, S.C., .052, 8.878 breakout on an 8.900, 72.45 mph; Maxton Locklear, Rowland, .078, 11.702 on an 11.630, 54.45 mph, def. Stanley Chavis Jr., Red Springs, .017, 8.692 breakout on an 8.700, 72.61 mph; Dylan White, Cordesville, S.C., .075, 7.910 on a 7.920, 82.83 mph, def. Shelby White, Cordesville, S.C., foul; Connor Caulder, St. Pauls, .086, 7.895 on a 7.900, 81.40 mph, def. Hayden Dial, Lumberton, .080, 7.883 breakout on a 7.900, 79.18 mph; Budd Trammell, Aynor, S.C., bye. Round 4 – White, .048, 7.925 on a 7.900, 82.73 mph, def. Caulder, .055, 7.933 on a 7.900, 81.00 mph; Chapman, .156, 8.905 on an 8.920, 72.53 mph, def. Trammell, foul; Locklear, .088, 11.761 on an 11.630, 54.44 mph, def. Brayboy, .192, 12.036 on an 11.890, 51.85 mph. Semifinals – White, .001, 8.139 on a 7.910, 69.59 mph, def. Chapman, .172, 9.042 on an 8.900, 69.99 mph; Locklear, bye. FINAL – Dylan White, Cordesville, S.C., .080, 8.005 on a 7.920, 74.47 mph, def. Maxton Locklear, Rowland, .206, 11.765 on an 11.660, 54.633 mph. Round 5 – Steve Hillburn, Loris, S.C., Chevy S10 truck, .035, 5.548 on a 5.490, 125.67 mph, def. David Pittman, Evergreen, 1972 Chevy Nova, .030, 6.163 breakout on a 6.180, 109.80 mph; Billy Stewart, Shannon, 1981 Chevy LUV truck, .039, 6.282 on a 6.280, 106.25 mph, def. Donald Norris, Conway, S.C., .034, 5.718 on a 5.710, 118.21 mph; David Lowe, Rowland, .010, 5.658 on a 5.620, 118.56 mph, def. Smokey Dial, Maxton, foul (-.003); Cory Wright, Loris, S.C., 1987 Mazda, .059, 6.281 on a 6.240, 105.88 mph, def. Barry Nall, Eagle Springs, 1969 Plymouth Roadrunner, .001, 6.413 breakout on a 6.420, 102.92 mph; Chris Dean, Sanford, .026, 5.930 on a 5.920, 115.57 mph, def. Derrick Taylor, Shannon, 1971 Dodge Demon, .010, 5.882 breakout on a 5.890, 117.80 mph; Jerry Martin, Aynor, S.C., Chevy Beretta, bye. Round 6 – Stewart, .018, 6.313 on a 6.280, 106.62 mph, def. Dean, .040, 5.939 on a 5.920, 114.40 mph; Martin, .001, 5.530 on a 5.470, 122.77 mph, def. Hillburn, .024, 6.006 on a 5.490, 91.99 mph; Lowe, .004, 5.728 on a 5.640, 109.24 mph, def. Wright, .045, 6.314 on a 6.240, 105.65 mph. FINAL – David Lowe, Rowland, .018, 5.716 on a 5.680, 109.30 mph, def. Jerry Martin, Aynor, S.C., Chevy Beretta, .071, 5.580 on a 5.470, 121.50 mph. Round 5 – Allen Furr, Richfield, 1962 Chevy II, .020, 6.605 on a 6.570, 100.12 mph, def. Donald Barnes, Evergreen, 1972 Chevy Nova, .090, 7.665 breakout on a 7.670, 87.89 mph; Ricky Bullock, Sanford, 1971 Dodge, .092, 6.195 on a 6.190, 109.82 mph, def. Tim Wilson, Fayetteville, 1998 Ford Mustang, .013, 9.013 breakout on a 9.020, 76.76 mph; Willy Buie, St. Pauls, 1972 Chevy Nova, .029, 6.710 on a 6.690, 102.04 mph, def. Make Soles, Delco, .053, 5.606 breakout on a 5.610, 122.93 mph; Bill Clardy, Loris, S.C., 1974 Chevy LUV truck, .043, 6.332 on a 6.320, 106.45 mph, def. Chad Terry, Efland, .101, 7.073 on a 7.050, 95.70 mph; Allen Furr #2, Richfield, 1962 Chevy II, .039, 6.581 on a 6.570, 103.46 mph, def. Ricky Bullock #2, Sanford, 1972 Dodge, .064, 6.187 breakout on a 6.190, 108.00 mph. Round 6 – Furr, .042, 6.578 on a 6.570, 103.63 mph, def. Clardy, .016, 6.295 breakout on a 6.320, 107.50 mph; Bullock, .155, 6.200 on a 6.190, 109.80 mph, def. Buie, foul; Furr #2, bye. Semifinals – Furr def. Furr #2; Bullock, bye. FINAL – Ricky Bullock, Sanford, 1971 Dodge, .091, 6.394 on a 6.180, 100.99 mph, def. Allen Furr, Richfield, 1962 Chevy II, .053, 6.942 on a 6.570, 103.03 mph. Round 3 – Ethan Locklear, Pembroke, .125, 8.910 on an 8.900, 73.44 mph, def. Brody Callahan, Fayetteville, foul; Nolan Callahan, Fayetteville, .008, 14.003 on a 13.950, 45.39 mph, def. Alyssa Rabon, Florence, S.C., .114, 8.935 on an 8.930, 71.54 mph; Budd Trammell, Aynor, .063, 8.959 on an 8.930, 71.46 mph, def. Tanner Brayboy, Maxton, .210, 11.936 on an 11.880, 52.19 mph; Dylan White, Cordesville, S.C., .066, 7.951 on a 7.920, 82.13 mph, def. Hayden Dial, Lumberton, .076, 7.953 breakout on a 7.960, 80.35 mph; Donald Brad Johnson Jr., Orangeburg, S.C., .052, 8.017 on a 7.970, 76.46 mph, def. Shelby White, Cordesville, S.C., .117, 7.935 on a 7.920, 81.51 mph; Connor Caulder, St. Pauls, bye. Round 4 – Johnson, .050, 8.023 on a 7.970, 78.57 mph, def. Trammell, .089, 9.023 on an 8.940, 71.28 mph; Locklear, .158, 8.948 on an 8.920, 72.62 mph, def. Callahan, .060, 14.369 on a 13.980, 43.89 mph; Caulder, .028, 8.000 on a 7.900, 76.23 mph, def. White, .159, 7.962 on a 7.950, 79.90 mph. 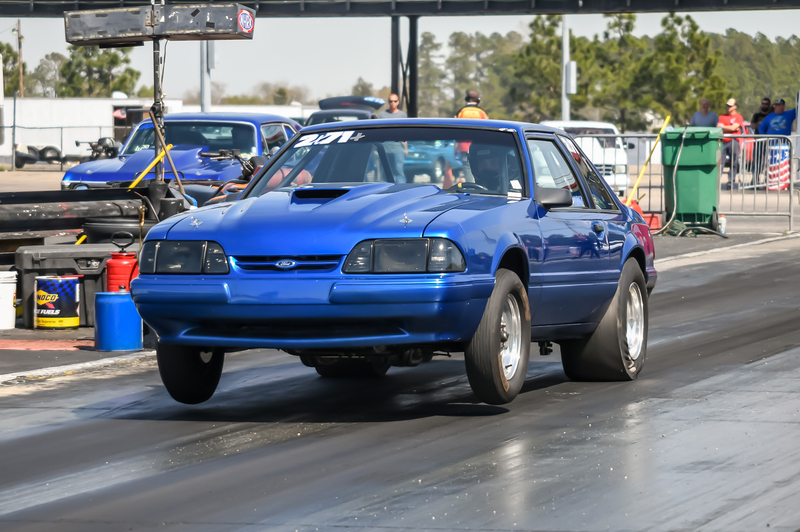 Semifinals – Caulder, .052, 7.900 on a 7.900, 79.76 mph, def. Johnson, .084, 7.950 breakout on a 7.980, 79.58 mph; Locklear, bye. FINAL – Connor Caulder, St. Pauls, .044, 7.915 on a 7.900, 77.60 mph, def. Ethan Locklear, Pembroke, .031, 8.848 breakout on an 8.860, 73.68 mph.